My painting progress slowed this week as Monday night I had to run into town to pick up my Forge World order from driodman, and last night was Valentine's Day and I spent it with my honey. Since I'm playing tonight, no love for the scoprions until tomorrow night. To make matters worse, we are leaving Friday afternoon for the weekend. So scorpions may not be finished for a while yet. 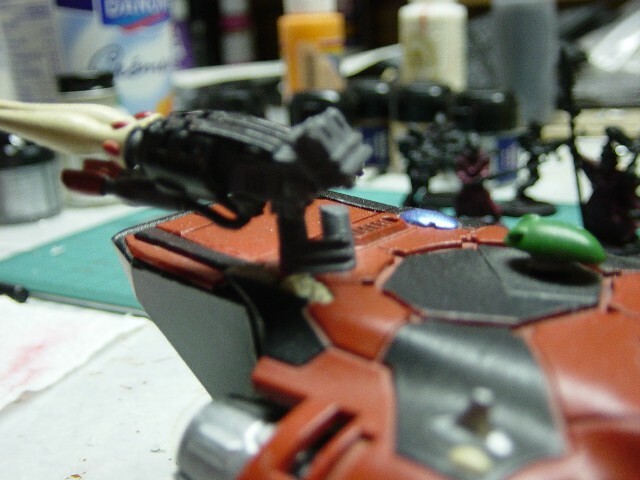 I also got a Forge World turret for my custom build Wave Serpent. 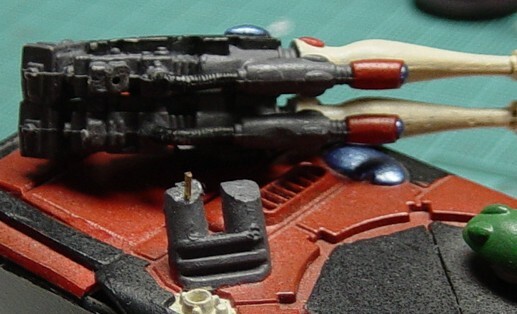 You see, back in the day the Wave Serpent had rules but no model, not even from Forge World. The only 40K scale wave serpent was one custom built by the guys in White Dwarf based off of the Epic scale model. I got really adventurous (for me anyway) and made my own wave serpent from a falcon and plasticard. I was so proud of it, the only thing I thought sucked was the turret I fashioned. As you can see, not a work of beauty. But hey, at the time there was no other option. 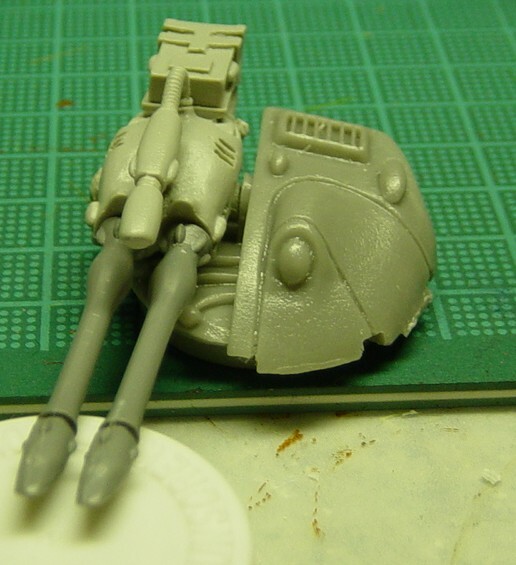 Of course, a couple months later Forge World offered their interpretation of the Wave Serpent conversion with its slick rounded turret and my custom jobbie looked like crap in comparison. Sigh. So, I've always wanted to get a Forge World turret. Latey I've tried three times. Once through Corey but it got lost in the move. Once through Benoit, but that fell through as well. Finally my latest attempt succeeded and I got it Monday night. To my horror, however, the mold was offset and the brightlances were horribly deformed and unsalvagable. 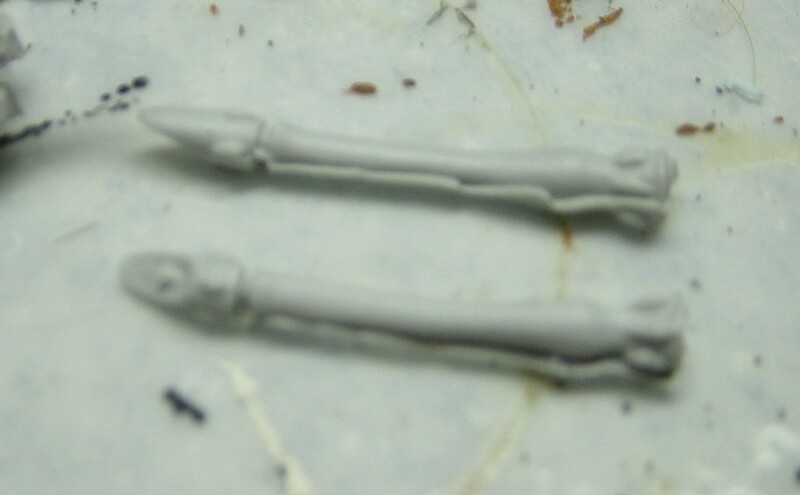 Rather than admit defeat and try to return them or order new ones, I chopped them off the weapon housing which was recoverable and stole the two plastic brightlances from my new wave serpent kit, chopped and filed, and then glued them on. Perfect! As you can see, the turret is ready for painting. 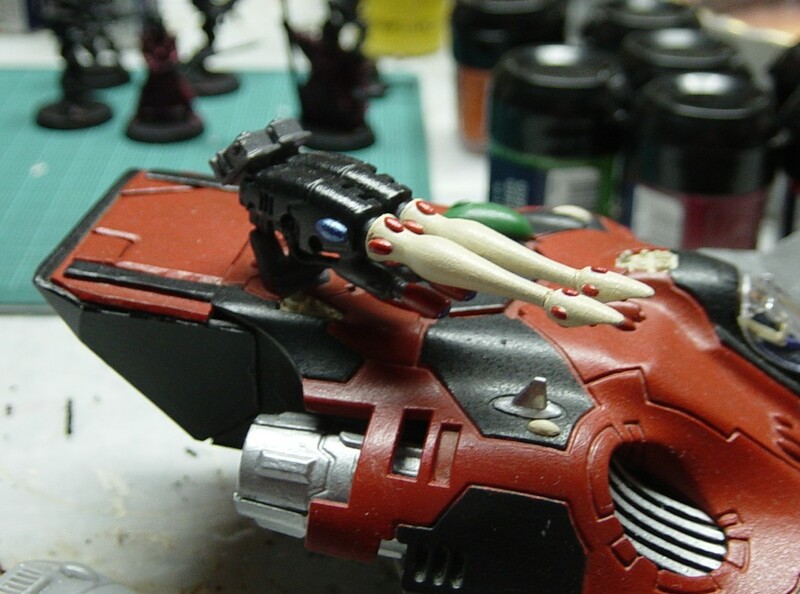 Soon my custom wave serpent will be slightly more acceptable. Those epic buildings are sweet, and they'll fit in nicely with your monster city. Do you have any plans for getting more? 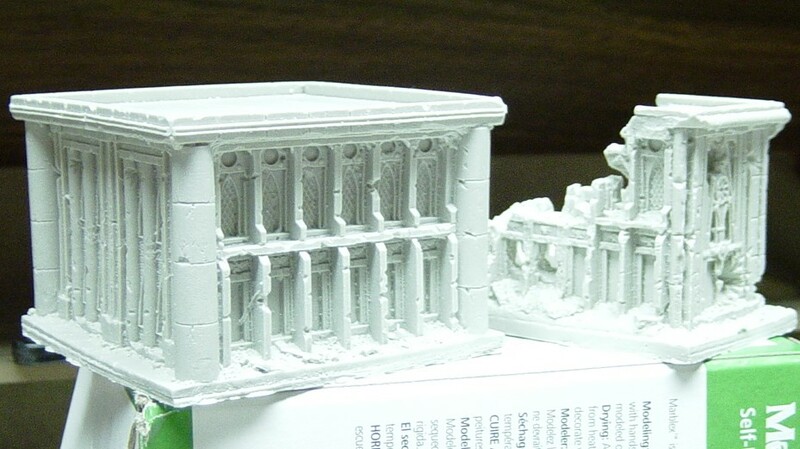 Yes, my eventual goal is to get enough Forge World buildings and plastic ruins to leave the card buildings off the table and do a city of just Forge World terrain and ruins.